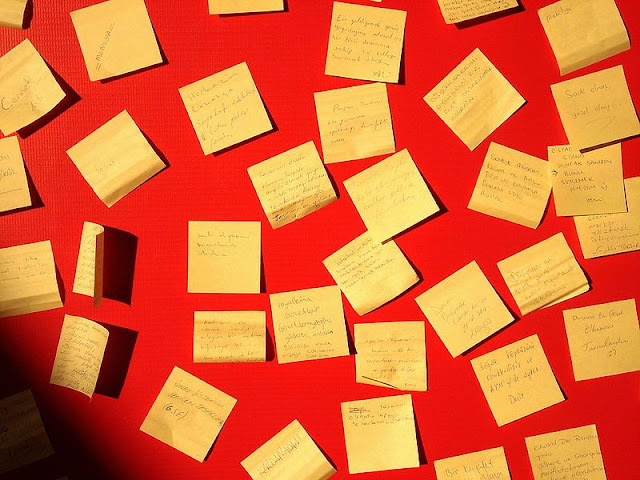 Training, facilitation, meetings, planning, designing, writing, games, memos, messages, even paper sculpture … from postage stamp to flip chart size, like so many of the best ideas, the Post-It note is staggeringly simple – and yet its uses seem to be limitless. Colour tabs are handy to mark speaking notes, maps, books. Tiny ones are great for time management in your paper diary and wall planner – move events round until they’re definite. Small ones are great for designing websites on paper and on cafe tables, writing articles and books, planning and preparing training and presentations, organising performances and other events with complicated logistics and running orders – one for each page, post or task and move them about until it flows. For training and facilitation, if you’re gathering comments and ideas to group on a flipchart-size note, ask for one idea per Post-It and give out medium size notes and fat marker pens so everyone can see the writing. Otherwise you’ll get a pile of spidery little essays no-one can read at a distance. Use one colour note for the pros, another for the cons, for graphic impact. Or one colour and size for the first big ideas on a mind map poster, others for drilling down into detail. Then you can rearrange and group them into clusters of ideas and see what’s emerging. Peel them downwards off the pad, not upwards – then they won’t curl up on the flip chart. Photograph the finished poster as a colourful record of the ideas you captured that day, then email them round or use to illustrate reports. Photograph one word on a Post-It from artistic angles and collect striking illustrations for your articles and blog posts.